Few things are as comforting as a pie and we all have our favourites – whether that’s traditional steak and kidney pie, a succulent pork pie or a sweet apple pie. And soon it’s British Pie Week (6-12 March 2017) – when all things pie related will be honoured, celebrated and enjoyed. This year over 890 pies have been entered into the British Pie Awards with winners due to be announced next Friday, 10 March. When it comes to the baking the perfect pie it’s clearly not ‘as easy as pie’! Apparently, pie-like dishes have been around since the ancient Egyptians, but the pie we know and love reportedly has its roots in Northern Europe. It is believed that the early ‘pyes’ were predominantly meat pies and that originally the pastry cases served as disposable containers for the filling. There’s no denying that we Brits take our pies seriously and recently over 5,500 people signed a petition arguing that calling a pie with no bottom a pie should be made a criminal offence, arguing that a casserole with a lid was categorically not a pie. The Guinness World Record for the most expensive meat pie ever sold goes to the Fence Gate Inn in Lancashire, which sold slices of its extra special pie for £1,024 a slice! Ingredients included Japanese wagyu beef fillet, Chinese matsutake mushrooms, rare black truffles, French Bluefoot mushrooms and gravy made from vintage wine, all finished off with edible gold leaf! And while Lancashire is also home to the annual World Pie Eating Championship it’s the West Yorkshire parish of Denby Dale that has a long history of baking giant pies. The tradition began in 1788 to celebrate the recovery of King George III from mental illness. 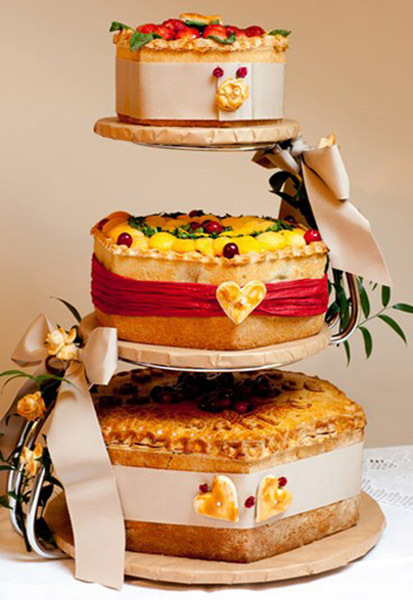 To date ten pies have been made as part of nine pie festivals. The most recent in 2000, weighed 13 tons and celebrated the new millennium. No surprise then that the village hall is aptly named the Pie Hall and that a large planter outside is actually a former pie dish! Pies make memories, there’s no doubt about that! Pie and mash, pie and peas, pie and custard, pie and pickle, hot pies, cold pies, gala pies…there’s a pie for all occasions. Yes, let’s all celebrate British Pie Week!